Runners at the 17th annual Firecracker 5K and 10K saw the Branson Landing event turn into a steeplechase as they battled torrential rains and standing water throughout the respective races. Cameron Byrley of Springfield was the overall champion in the 5K, posting a time of 16:43. Jacquelyn Griffin of Ozark was the women's 5K winner, running 20:30. Carter and Clark Blunt of McKinney, Texas, controlled the 10K event. Carter touched the tape in 34:34.6 with brother Clark second in 34:34.8. Springfield's Rosie Laughlin was the top woman 10Ker, finishing in 44:18. The 5K race saw 328 runners cross the finish line, and another 101 completed the 10K course. Barry County runners claimed their share of medals. 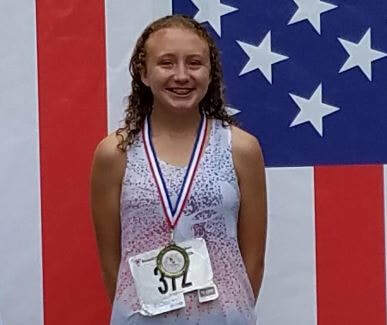 Cassville's Brylee Wilson won the women's 11-14 age 5K, running 22:42. Kayla Ragsdale placed second in the women's 30-34 5K age group with her 26:49. Josie Stubblefield took third in the women's 50-54 5K division, finishing in 27:22. Zoey Brookes and Leah Treadwell both pulled off fifth-place 5K finishes: Brookes in the women's 15-19 division in 25:43, and Treadwell in the women's 25-29 group in 27:00. Emily Wilson was eighth in the women's 11-14 5K group in 30:59. "It was a fairly flat course overall which made it a nice easy run, although it was a bit narrow for the number of runners," said Ragsdale, the acknowledged leader of a group of Cassville runners known as "The Jog Squad". She failed to mention the overwhelming rain that soaked shoes and apparel before the race ever started. Standing water was a hazard, especially along the gravel lane at the south end of the course, where ankle-deep holes lurked beneath the muddy water. Water hid directional paint and mile markers, leading to several runners straying off course. Runners without GPS devices could only wonder what their pace was at any given point. But as every runner knows, "place is more important than time." I won the men's 60-69 10K group, finishing in 45:50 and matched Brylee's gold medal performance. Training partners for two summers, she and I have been pretty successful with our program in spite of the 47-year age difference. She has wheels, I have endurance. We mix our workouts so each challenges the other's weaknesses, and it makes us both better runners. Next up: the Angie Swadley Memorial 5K at Purdy on Saturday. Race time is 7:30 am. I encourage all local runners to participate in this event. For more information on the Angie Swadley memorial race, call 417-846-7564 or email mrschelseapowers@gmail.com.